Beth Logan's whimsical art adorns home and garden products from coast to coast—now her signature style springs to life on the pages of this coloring book in a celebration of flora and fauna in our natural world. Inkspirations in the Garden features gardens in all their glory, from delightful cottage gardens to well-manicured backyards and gazebos, from vibrant wildflowers to well-pruned rose bushes—including cute garden visitors we've come to know and love. Filled with inspiring word art, and a mix of easier designs along with more elaborate pages, there is truly something for everyone. So grab your colored pencils or markers and bring each page into full bloom! I like gardening—it's a place where I find myself when I need to lose myself. Gardening and coloring have a lot in common. Both hobbies can transform a blank slate into a wonder of color, patterns, and textures. Both offer a way lose yourself doing something you enjoy. They relax you and enliven you at the same time by allowing you to create something with your own hands. Whether your preferred tool is a spade or a Sharpie, fragrant flowers or fragrant markers, making time for yourself is important. Leaving the demands of the day behind to spend time in nature or to create something is restorative to the soul. This book celebrates nature's gardens and the many ways in which they brighten our worlds. Even if you don't have the greenest of thumbs, you can still enjoy nature's bounty of color every day. So, relax, unwind, and let your inner artist bloom. Cross-hatching—As the name implies, cross-hatching means that you draw a series of parallel lines and then you make another set of parallel lines in another direction on top of the first set of lines. This creates both shading and texture. Basic shading—Use two similar colors to create a dimensional shading effect. Choose one lighter color and one darker color, both in the same color family. Leave the darker area with one color and then blend the colors together to create the lighter shade. Blending the strokes together will add depth and dimension. ©2016 HCI Books. All rights reserved. 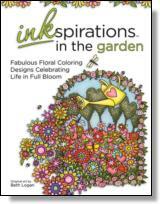 Reprinted from Inkspirations in the Garden: Fabulous Floral Coloring Designs Celebrating Life in Full Bloom. No part of this publication may be reproduced, stored in a retrieval system or transmitted in any form or by any means, without the written permission of the publisher. Publisher: Health Communications, Inc., 3201 SW 15th Street, Deerfield Beach, FL 33442.